New Testament or New Covenant? In many ways the familiar symbol to the right requires no explanation. It is the universal insignia of firefighting nationwide. Yet the precise origins of this symbol are less clear. The most popular explanation proposes its beginning in the far distant past of medieval Crusaders fighting back the incendiary weapons of their Middle Eastern enemies in the Holy Land. Linking the symbol to the Maltese Cross of the Knights of St. John, they recall how these ancient warriors used this cross on their armor to identify themselves in battle. These brave knights, it is said, frequently risked their own lives to save another knight or to extinguish a fire. However the Firefighter’s Cross is actually no t a true Maltese Cross and only loosely resembles the one worn by the brave Knights of St. John (as seen in the image below the Firefighter's Cross to the right.) It’s a nice idea to think that there might be a connection between these ancient knights extinguishing fires in time of war and the modern “warrior of the flames,” but the connection has never been proved. At the very least we recognize that modern firefighting is in the “spirit” of their work, if not a direct continuation of it. MAYBE THE CROSS OF ST. FLORIAN? Some have identified the Firefighter's Cross as the cross of St. Florian. Given Florian’s historic association with firefighting as its 'patron saint,' one can see how the connection was made . Jewelry with the image of St. Florian imposed on the Firefighter's Cross is often identified as the cross of St. Florian or even as a St. Florian Maltese Cross, but unfortunately without any firm historical proof. Florian (250-304 AD) was a soldier and high ranking officer in the ancient Roman army. He is credited with helping to organize and lead early fire brigades that defended the city of Rome from fire. Pictures often show him dressed in the distinctive green tunic of the Roman firefighter, with himself or someone else pouring water on a fire. One picture as seen to the right has him holding a cross with a cross-marked banner. However, the cross here is clearly a Latin Cross in his hand, and possibly a Greek cross on the banner, yet clearly not the one seen in the familiar firefighter symbol. Florian was an early martyr of the faith who was originally supposed to be burned at the stake, but was later killed by drowning because he proclaimed himself a believer in Jesus Christ. His service to his fellow man in fighting fires and his eventual sacrifice for his Lord are wonderful examples for the service even today, even if we cannot say that the familiar symbol's cross is his distinctive cross. After all the research and investigation, the precise point of origin of this widely recognized symbol of firefighting remains shrouded in a mystery. We can conjecture, even draw some possibilities, but we may never know for certain. It may very well be unique with no direct ties to any other known form of the cross. Nevertheless, what we do know is that whatever type of cross it is, it is a cross that was used. And it is very probable that this cross was borrowed from the religious realm, and not simply adopted simply for stylistic reasons. Given the inherent danger of firefighting it is appropriate for the firefighter to have such a symbol of hope and faith. When faced with the life and death realities of raging fires and other disasters, the firefighter realizes that they are not impervious to debilitating or even fatal injury. Disability and death are always a possibilities, and therefore so is the need for real hope and assurance of God's continued help and presence. Thus, the cross first reminds the firefighter of what God has given to the world for their eternal salvation through Jesus Christ. It is the place where God’s Son died in payment for the world’s sins, that whoever believes in Him would not die forever, but rather receive eternal life. The cross, therefore, is the place where forgiveness was earned on our behalf, and this is especially important for those who work the front lines of great danger. Fire and rescue people know that the mistakes made in their work may have far more tragic results than for the normal citizen. They can too easily carry heavy burdens of guilt for failed missions. But in the cross they find full forgiveness and unconditional love from a God that accepts us in in all our imperfections and all our failings; a God that absolves us especially when we are unable to absolve ourselves. And looking at the cross we thus see a powerful model of sacrifice that can be reflected further in our own work. Fire and rescue personnel are called to give of their time and energy and even sometimes their very lives, often without compensation or gratitude. By its very design it must be selfless and self-giving. The cross is a symbol of sacrifice, first that of God’s Son on our behalf, and secondly for the believer who gives in Christian love to his neighbor. In this way the work of both the Knights of St. John and Florian may remind us of this aspect of the cross in our ongoing work of fire and rescue work. We give of ourselves that others might live. Aside from this, the symbols within the firefighter’s cross also hold additional meaning that should not be omitted. These are not religious symbols, but rather signify the work and readiness of the firefighter. The symbols as a unit are referred to as the “scramble,” are often part of various fire department insignia. The color red reminds us first of the fire to be fought and conquered, as well as the courage of the men and women who are enlisted in this fight. The trumpet represents leadership and is reminiscent of the early history of firefighting when officers had to communicate with these primitive types of ‘loud speakers’ to direct those under their charge. The helmet reminds us of safety, for although the firefighter often enters areas of great danger in which others would never dare to go, they are trained to take every precaution that those who leave for work may still return to serve another day. The ladder, pick axe, and pike pole and hydrant are all tools of the firefighter’s trade, and remind us that this is a highly specialized work requiring careful study and ongoing training on the part of every firefighter. Although it was shown before that it is not possible to prove a direct link between the Maltese cross and our current symbol, traditions associated with the cross have nevertheless been carried over into the Firefighter’s Cross. In the past there was a tradition that has assigned various virtues to the eight points of the Maltese cross. Some see in its eight points the Beatitudes from the Bible. Others see in them the eight chivalric virtues of the ancient medieval warrior, which were: loyalty, piety, frankness, braveness, glory and honor, contempt of death, helpfulness toward the poor and sick, and respect for the church. There are more still. The fire service, however, while undoubtedly borrowing from these and others, appears to have assigned its own unique virtues as well, which are: pride, honor, charity, loyalty, gallantry, generosity, dexterity of service, and protection, especially of the weak. Although it could be argued that this is not technically a cross, in the traditional sense of the word, it is the second most widely recognized symbol associated with fire and rescue service. A relatively new symbol, the Star of Life for Emergency Medical Services (EMS) was originally designed in 1977 by Leo R. Schwartz , who was then chief of the EMS Branch of the National Highway Traffic Safety Administration. It came about after the American Red Cross, themselves represented by the cross symbol, objected in the early 70’s to the use of the Omaha orange cross on a white reflectorized background, which often appeared on ambulances. They claimed that it too closely resembled their own symbol. Each of the six arms of the star (or cross) represent features of the EMS work: detection, reporting, response, on scene care, care in transit, transfer to definitive care. The staff and serpent in the center of the symbol, which resembles the common symbol used in medicine, represents Asclepius, a Greek god from which people claimed to find cures and healing. *As an aside, the red cross used in the symbol of the American Red Cross association, which frequently works in cooperation with fire departments and other emergency personnel and organizations. The red cross was the original protection symbol for relief aid following the Geneva Convention of 1864, and is a reversal of the Swiss Flag (which is a white Greek cross on a red background) in honor of its founder, Henry Dunant, and his home country of Switzerland. As a chaplain who proudly carries the cross of Christ on my uniform and my badge as a sign of hope and peace to all, I pray that this special cross which adorns our honored craft and work of sacrifice for those in need, might continually remind each firefighter of the unlimited grace and love of God in Christ Jesus which rests upon us and watches over us in oru hour of need. 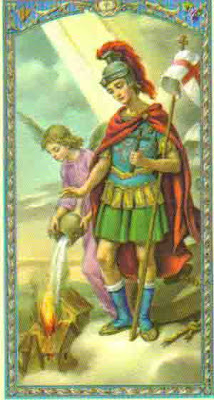 Please provide reference as to the historic accuracy that St. Florian had a cross such as you depict. This blog is causing confusion as to the history of the firefighters cross. Please provide data or site it as opinion, not fact. Thank you for your comment, Thomas. I'm sorry for any confusion I may have caused. I believe the information regarding the symbol here featured being St. Florian's cross was borrowed from the work of Mica Calfree referenced at the end of the article. I also notice that Wikipedia references the same symbol as "St. Florian's Cross" as well at: http://en.wikipedia.org/wiki/Saint_Florian. Checking the origin of the image there it appears that it circles back to Calfree's work at: http://www.riotacts.com/fire/maltesecross.html. Perhaps Mr. Calfree can supply the background for the origin or theory of this symbol being "St. Florian's Cross." It appears that the symbol I borrowed from Mr Calfree's paper is sometimes equated with the so-called "Maltese Cross" as this is mistakenly identified with the actual firefighter's cross. The firefighter's symbol, however, is not a true Maltese cross, which is a cross formed by four equal triangles or arrowheads joined at their points. From my limited research it seems that the firefighter's cross being equated to the so-called St. Florian's cross arises out of fact that St. Florian is the traditional saint of firefighter's. This, indeed, may be a "chicken and egg" dilemma, as it is hard to know which came first. For the record I cannot conclusively claim, historically speaking, that St. Florian had a cross specifically like this. It bears more study. Your language in your article still implies that St. Florian has a tie with this design -- it is misleading and threatens the integrity of the history of the firefighters cross. I'm sure this is not your intention. Please site historical evidence that St. Florian used this symbol, or remove it so it does not cause confusion. Your webpage is being used as reference for this confusing association and I am sure you do not want to be the one that everyone points to when they realize that they have been mislead. Thank you. I have made corrections in the article making it clear that although this symbol is often identified as St. Florian's Cross, such an identification is without firm historic proof. I hope that this change is satisfactory. Thank you for this informative article. It would be interesting to research the St. Florian cross to find the oldest print or painting with the same design, as that would be the best way to gain insight to its origional purpose and design. I would agree that it is not a Maltese cross.